Posted in Events, Recap. Bookmark the permalink. 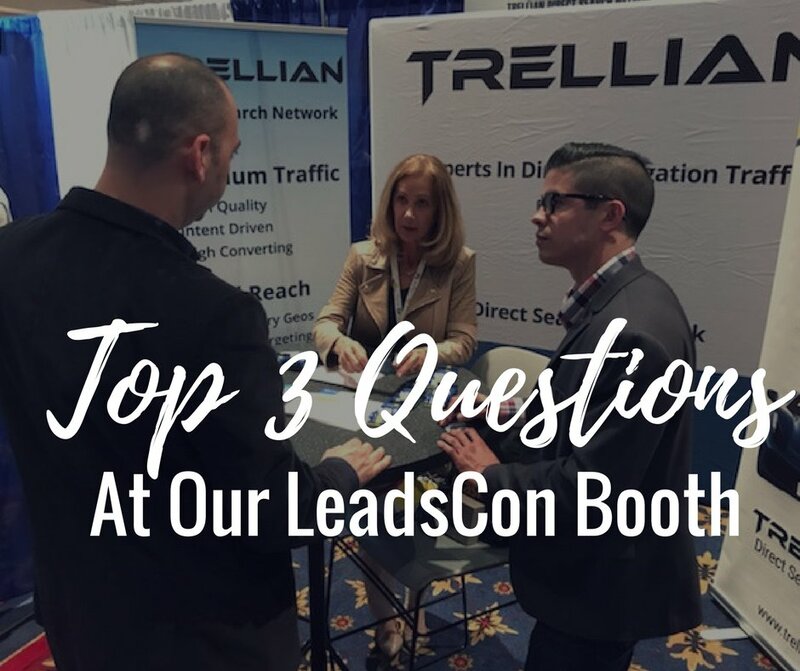 If you missed LeadsCon or didn’t make it by the Trellian booth, we have you covered! Louie and Nancy explain domain redirect traffic to a visitor at our booth. Click here to see more pictures from Leadscon 2018. Our team had a great time explaining the concept of domain redirect traffic at LeadsCon. Attendees lit up as they learned of the great potential to bring in qualified leads at cost-effective prices! 2. Wow! I had no idea that existed, but do you have traffic in my vertical? Is it expensive? Not only do we have traffic from 200+ GEOs/countries, but we also have traffic in nearly every vertical. Just contact your account manager with details on your vertical, and we will find it for you! Our traffic is highly cost-effective when looking at ROI. The cost of acquiring domain redirect traffic is cheaper than more traditional forms of traffic such as PPC. A familiar comparison would be to think of it as search-level intent at display pricing. Exact costs come down to verticals and sub-verticals. After creating an account, your account manager can post recommended keywords that will show average/high bids as well as available volume. 3. What is the process like to get up and running with my campaigns? We understand that time is money, so we make getting started simple. Since our platform is self-serve, you can launch campaigns almost immediately! Scroll through the quick start guide for details on getting started. Just sign up for an account, deposit funds, and choose what kind of campaign you want to run (keyword or run-of-network). Keyword campaigns set bids on keywords they’re watching and run-of-network traffic is broken into pre-set price tiers based on quality. Remember that your account manager is happy to jump in at any point to help get you started.